"I make this dressing, and have it on hand in the fridge to use on any vegetable salad. Recipe is easily doubled." You might as well throw some poppyseeds in Miracle Whip. The results would be the same. This recipe was awsome. My mom loved the lightness of it. I used a little bit of real mayo instead of salad dressing mayo. Loved this dressing and used spenda in place of sugar. 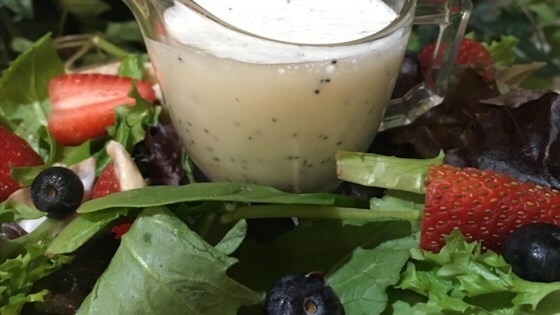 Makes for a lower calorie dressing than the others that have oil in them. This recipe is definitely easy. I used the regular Miracle Whip. I tasted too much Miracle Whip. I'm going to try it again with fat-free. Yum! Great flavor over fresh fruit salad. A tiny bit goes a long way. Kids loved it too, so may use it as a "fruit dip" for snacking. This is incredibly tasty and has a wonderful texture. I will definitely make this dressing over and over. It's healthy and delicious... what better combination is there?